Following a very positive supporters’ questions evening last Thursday, a handful of Belper fans had a first taste of what is to come as new manager Grant Black kicked off pre-season with a visit to South Normanton last Saturday. What is noticeable from the line up is that all the players have plenty of experience behind them and, against a big physical South Normanton side, it showed, particularly in the first half. If Joel Ambalu’s first goal of the pre-season campaign has set a standard then look out for some outstanding displays from the former Torquay and North Ferriby striker. His goal on 18 minutes was out of the top drawer when it comes to ball control and finishing skills. Ambalu received the ball in a central position just outside the penalty area, and in one silky swerve of his hips created a window on goal, and he dispatched a fearsome left footer well out of reach of Shiners’ ‘keeper Curtis Hall. Hard working South Normanton levelled the score in the 28th-minute when Joel Earps turned to hit an effort goalbound and Belper ‘keeper Max Beardmore let the ball slip under his body and into the goal. 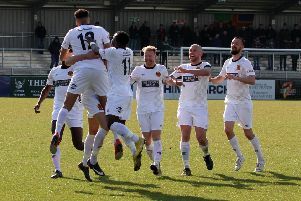 The Nailers restored their advantage within a minute when Ricky Paylor sent a powerful header from a corner kick firmly beyond Hall in the Shiners’ goal. With temperatures approaching 28 degrees C, and with a myriad of substitutes from both sides throughout the second half, the quality of play, seen frequently in the first half, was less obvious in the second as it finished 2-1 to Nailers. The scoreline remained unchanged although the hosts did have there fair share of the ball and made the Nailers work hard to retain possession. Belper Town: Max Beardmore, Darryl Lucas, Cameron Clark, Sam Colbear, Jake Sturgess, John Guy, Jake Elam, Ricky Paylor, Alex Peterson, Joel Ambalu, Danny Gordon. Substitutes: Nathan Curtis, Marcus Daley and others.